My name is David Dyer and I've been performing stand up comedy all over the country for about 24 years. Typically, website bios contain information about who I've worked with, the shows I've written for, a list of TV and radio credits, the specific venues I've performed at, blah...blah...blah. Trust me, a good percentage of that stuff you'll see is crap. I'm not going to waste your time. I will tell you this...during my two-and-a-half decades as a comedian, I've gotten pretty good at this. 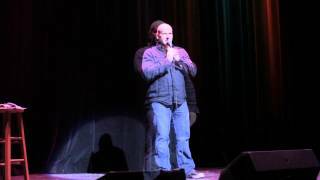 I view more..
My name is David Dyer and I've been performing stand up comedy all over the country for about 24 years. Typically, website bios contain information about who I've worked with, the shows I've written for, a list of TV and radio credits, the specific venues I've performed at, blah...blah...blah. Trust me, a good percentage of that stuff you'll see is crap. I'm not going to waste your time. I will tell you this...during my two-and-a-half decades as a comedian, I've gotten pretty good at this. I've performed in some of the s#$%&iest places you can imagine and also, some of the very best. I've played for every type of crowd from Credit Union employees during their annual Holiday Party to a room full of 400 angry people in Birmingham, AL who couldn't get their new menu items fast enough, to 5,000 people at an incredible outdoor amphitheater. I've dealt with difficult bookers, faced mountains of rejection on a nearly daily basis, waited weeks, months, years to hear back from club owners only to be told "no". And I've survived. The reason I've survived is because there is nothing...NOTHING...like performing live comedy and after all of these years, I still love it. The feedback is immediate and just. If you're good and they like you, you'll know it. If not...ditto. For the 45-60 minutes during a performance, I get to transport you somewhere other than where you are the other 10,020 minutes of the week and try to get you to relax and forget about the daily grind. That's my job! It's like a verbal massage except the "happy ending" usually involves some sort of carbonated beverage shooting from your nasal passages. What do you want for $15?